The 410 shotgun is one of the most interesting shotguns out there. In actuality, it is not a gauge, it is a 41 caliber shotgun, and due to its size, it is featured on some unique firearms such as handguns and also multi-caliber combo guns. 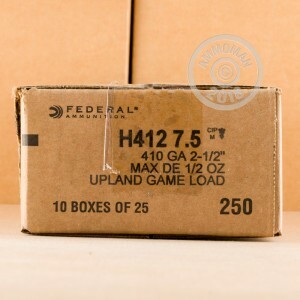 Federal has been around since 1922, and with that time, they have become one of the premier ammunition providers in America. 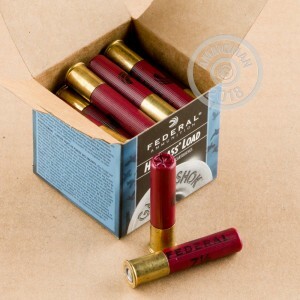 With these hi-brass Game Shok shells, you have just what you need for small game hunting. 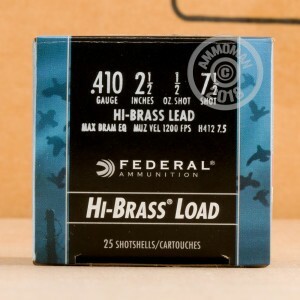 Each hull in this box of 25 measures 2-1/2" and carries a 1/2 ounce column of #7 shot. Designed to give you the high quality components of Federal, the Game-Shok line of ammo delivers reliable performance at the right price. Don't forget, all orders over $99 qualify for Free Shipping at AmmoMan.com!